Like the Signature, the Aurora is a hybrid mattress. Key features of this model are copper gel (in the cover and a foam layer), another PCM (TitanCool), Energex foam (polyurethane foam engineered to share properties of both memory foam and latex), titanium gel (a heat-conductor), other elastic foams, and encased pocket coils. The Brooklyn Aurora consists of the cover, three foam layers, and a pocket coil support core with a base pad. At 13” high, this is the tallest of the Brooklyn Bedding models. Some of the details of construction are used to determine the firmness level of the mattress. Brooklyn Bedding describes the cover fabric as “A premium smooth top weave” which is quilted with polyfoam. This is in contrast to sources that describe it as a “circular knit” or as rayon and polyester. The role of the weave is to let air go through for cooling. “Rayon” is correct when it comes to the fire sock, which is rayon from bamboo infused with silica. The top layer (comfort layer) of the Brooklyn Aurora is 1½” of Copper Gel Energex, a foam with properties between memory foam and latex. Some may call it “latex-like foam”, or “memory foam stand-in”, or “memory latex.” The Energex is infused with copper gel, and surface-treated with TitanCool, both phase change materials (PCMs). Copper gel is a material developed for a number of functions. The top three are temperature regulation (as a PCM), microbe inhibition, and odor control. It is now being widely used in a number of applications, including comfort foams. TitanCool’s primary function is temperature regulation. It may contain titanium, but on the other hand, may simply be named for TitaniumGel, the featured infusion in Brooklyn Bedding’s TitanFlex. On the other hand, it could be a form of TitaniumGel, since high conductivity is cited for this material. The firmness of the top layer is ultra plush for the Soft option, medium for the Medium option, and luxury firm for the Firm (see chart below). This is the second comfort layer (which one independent reviewer called a “compression layer”). It is 2” of TitanFlex, a latex-like foam (TitanFlex replaced latex in the changeover from #BestMattressEver to Brooklyn Signature). This layer’s firmness is one of the determinators of the overall mattress firmness selected by the customer: Plush in Soft, medium firm in Medium, firm in Firm (see chart below). This transition layer is 1” of Swirl Visco-Elastic Memory Foam, making this the only current Brooklyn Bedding mattress with memory foam. Memory foam is usually used for pressure relief through conformity to the sleeper’s shape and weight. However, being in the third layer down in the Brooklyn Aurora, it is used for motion isolation. This memory foam is gel infused for cooling. This layer is also firmer than those above, so it serves as support transition. The firmness of this layer is firm in all firmness options (see chart below). 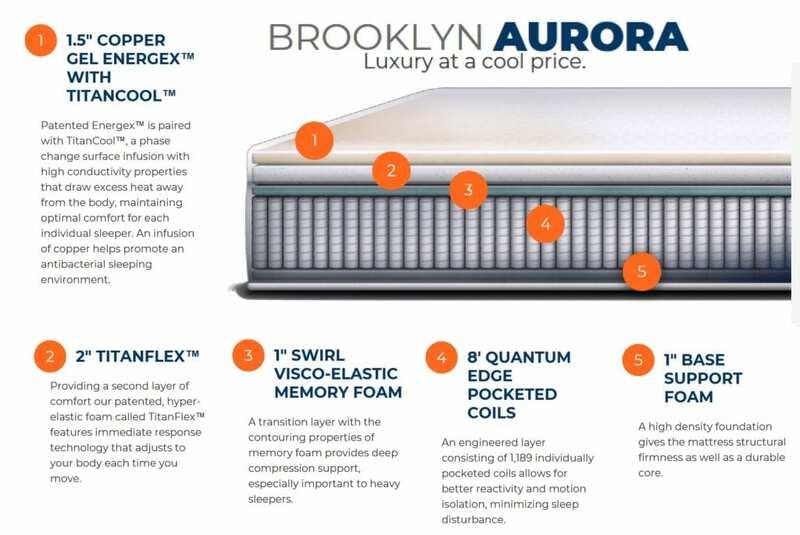 The support core of the Brooklyn Aurora is 8” high encased pocket coils – up to 1,283 in a King-size mattress – 2” higher than those in the Signature. Since pocket coils respond independently (they are not tied to each other), they cancel motion transfer and reduce pressure points, working with memory foam in these functions. One contrast between the two components is that as springs the pocket coils keep applying pressure, while the memory foam’s memory eliminates pressure. Since pocket coils are not tied together, they need containment on the sides and on the bottom. This is especially true when the mattress is compressed and rolled, as with the Brooklyn Bedding models. Therefore, BB undergirds their coil arrays with a base pad. This is 1” of extra firm polyurethane foam. Brooklyn Bedding depends on foam structure, PCMs, and gel-infusion for temperature regulation. Open-cell form does let air flow through, but not as much as perforations. That being said, manufacturers of foams, such as FXI, Carpenter Company, and Elite Comfort Solutions, claim that development of foam technology has led to foam with a more open cell structure, as well as the ability to respond to body heat without being as dense as memory foam. What is needed is side-by-side testing of these new foams with ventilated foam to determine the relative airflow through these materials. Gel infusion admittedly has its limits – a few mattress manufacturers only claim initial cooling. The reason is that gel absorbs the sleeper’s body heat, and there is a limit to how much it can absorb. It takes longer for gel to reach heat saturation than it does for memory foam, which does give memory foam with gel an advantage over memory foam without gel – that is unless the memory foam is ventilated. Gel does keep cooling if it can transfer heat out. This happens when air is flowing through – the greater the airflow, the more efficient the gel. The efficiency of the gel also depends on the kind of gel itself. Newer gels with metals, especially titanium and copper, are more efficient than the first cooling gels. Phase change materials are not just for cooling. They are for temperature regulation. PCMs are engineered to keep the temperature within a specified rang. They absorb a large amount of heat when they liquify at the top of the temperature range, and release a large amount of heat by solidifying at the bottom of the range. There is a limit to PCMs, though. When they are totally liquefied, they cannot absorb enough heat for cooling. Likewise, they cannot release any more heat when completely solidified. As it now stands, the most effective overall cooling is the patented Airflow Transfer System (ATF). 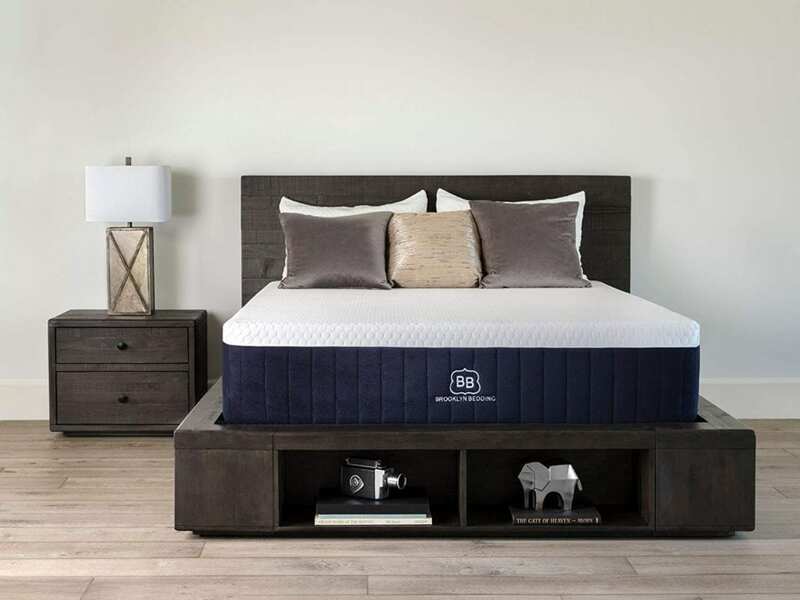 This was developed by Selectabed, is an option for its foam and Air-Pedic mattresses, and is a standard feature for TempFlow and Snuggle-Pedic (Selectabed brands). ATF fosters two-way airflow through the mattress. Micro-vents in the cover (both the sides and the top) let more air in and out. The upper foam layers are vertically ventilated, and the top surface of the foam base is channel-cut for horizontal airflow. At the time of this video, vertical ventilation had seven times the airflow of open-cell foam, and a mattress with ATF had demonstrably more airflow than mattresses with vertical ventilation only. 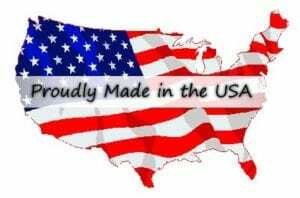 All Brooklyn Bedding mattresses are made in the USA in their Phoenix, Arizona facility, using USA-made components. 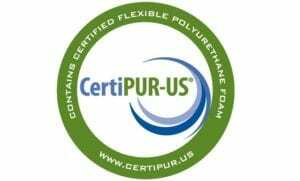 Their foams are certified by CertiPUR-US as free from harmful substances and low in emissions. They are sold online, on the company website, on Amazon, and in participating stores. The Brooklyn Aurora is compressed, rolled, sealed, and put into a box for shipping and delivery by FedEx. The box is long enough so that the mattress does not have to be folded lengthwise. The mattress is covered by a 120-night sleep trial and a 10-year warranty. Since it is boxed, a customer buying it in a store can take it home. 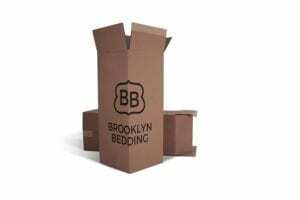 Customer reviews and ratings of the Brooklyn Aurora are found on Amazon and on Brooklyn Bedding. Although GoodBed has ratings for older Brooklyn Bedding/Dreamfoam Bedding mattresses, it only has descriptions of the Brooklyn Aurora, probably because it is so new. None of the Yelp reviews so far name the Aurora. As of 3/17/2019, there are only 29 customer reviews on Amazon for Brooklyn Bedding’s Aurora model with an average rating of 4.5 (80%). Customers gave the Brooklyn Aurora good marks for its support, sleeping cool, choice of firmness, and motion isolation. Most of the complaints are about slow delivery, while some think this high-end mattress is too pricey.